Venice attraction-guides.com - Venice, Italy attractions guide Venice Giardino Giusti (Giusti Gardens) nformation about attractions, history, plants, terracing, location and address, general tourist information about Giardino Giusti (Giusti Gardens) in Venice (Venezia) area, Italy (Italia) IT - Last updated 30/10/2012. One of the country's finest Renaissance gardens, the Giardino Giusti was laid out in 1580 and is within easy reach of Venice. 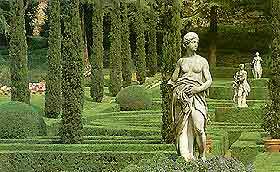 Giardino Giusti's beautiful formal gardens of clipped hedges, topiary, potted plants and statues contrast well with the upper natural area. These two very different parts of the Giardino Giusti (Giusti Gardens) are linked by stone terracing. The gardens are open daily and are full of appealing attractions for visitors from Venice.